Orangutans are large tree dwelling apes. Conservation Status: Degradation and destruction of the rain forest have threatened orangutans. Sumatran orangutan is at critical risk. 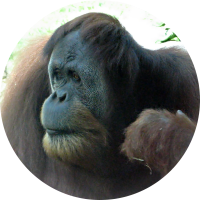 Size: Female orangutans are smaller than their male counterparts. Orangutans weigh between 73 to 180 lbs and are 4-5 feet tall. 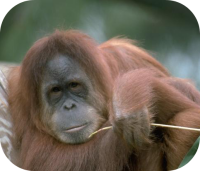 Orangutans can have a fingertip to fingertip arm span of 7 feet! Species: There are two species of orangutans. 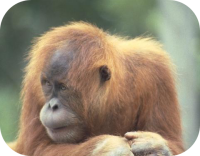 Habitat: Orangutans are found in Southeast Asia on the islands of Borneo and Sumatra. The orangutan resides in tropical rain forests. Gestation: Orangutans carry their young for about 8.5 months. Birth: Orangutans usually give birth in their tree top nests. Orangutan babies are 3.3 to 4.5 lbs at birth. Sexual Maturity: Male orangutans reach sexual maturity around 15 years age. Female orangutans reach sexual maturity around 12 years of age. Female orangutans only give birth every 8 years. Behavior: The orangutan is the largest tree-dwelling animal. 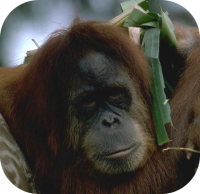 Orangutans will build nests in the trees. 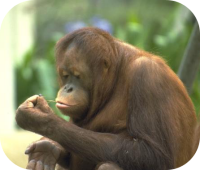 Diet: Orangutans eat fruit, leaves, tree bark, insects and rarely meat. 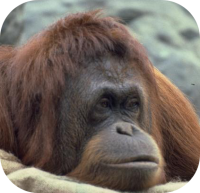 Description: Orangutans have large, bulky bodies, thick necks, long strong arms and short bowed legs. Orangutans have long reddish-brown hair that covers their body and limbs. Orangutans have opposable thumbs and opposable big toes. Communication: Orangutans have a series of calls used to alert of their territory, summon mates, and social calls. Orangutans share approximately 97% of their DNA with humans. Social Structure: Male orangutans are solitary, however females and their young will form strong bonds staying together for up to 7 years. Life Span: Orangutans have an average life span of 30 to 40 years in the wild. In capitivity orangutans will live up to 60 years. Unusual: Orangutans are intelligent and have been known to make and use simple tools. Orangutans will use large leaves as umbrellas to protect themselves from the rains.